The latest leg of the Gecko Pro Tour saw the players teeing it up at the Amenara Golf Resort set in the heart of the Sotogrande Estate, which is just a lob wedge from the Famous Valderrama Club. It is home of the Andalucía Masters and that stunning Ryder Cup win back in 1997, when Seve lead Europe to Victory. 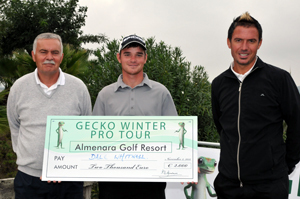 Valderrama will also be hosting a Gecko Pro Tour tournament in 3 weeks time. 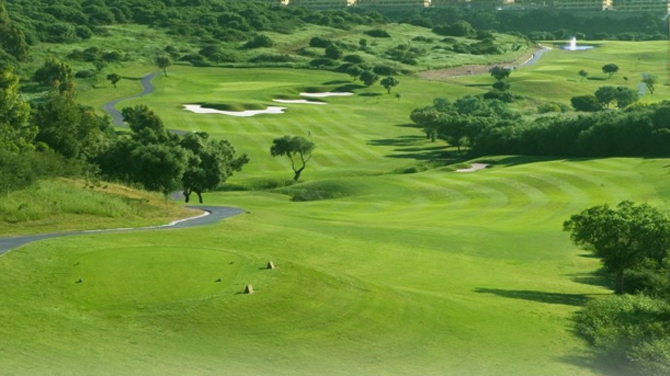 Almenara is a well-respected golf club that has the potential to stage European tour events. The course is fair, where everything is in front of you, with no hidden tricks or secrets. It’s a great tournament track and challenge. Day one saw the players teeing it up in near perfect conditions, a cooling sea breeze with temperatures up in the 70 degrees, was ideal for low scoring. Dale Whitnell wasted no time, straight out of the blocks and was four under for his opening nine holes. He then consolidated with two more birdies on the homestretch. His 6 under par, 66 was enough to be leader in the clubhouse. Young Englishmen James Scade also got off to a great start and finished with an opening round of 69, three off the lead. James Watts from Essex finished with a two under par 70 to take third place. Adam Saga, who has featured in most of this years tour events, had a solid round of level par. 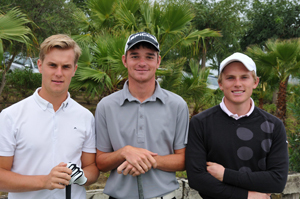 While Ignacio Papp, who won at La Cala earlier in the year, posted a 1 over score par 73, along with talented youngster Dan Aldridge. Day 2 saw the players facing a different test. The drop in temperature and stronger winds took the players by surprise. The par 5 550-yard opening hole seemed to baffle the early starters with plenty of players coming up short or making mistakes. Dale Whitnell wasn’t one of those players and made a solid par to open his final round. James Watts made a birdie, to catch James Scade and gain ground on Whitnell. Unfortunately for James Scade he suffered most in the conditions and eventually two double bogeys on the back nine put paid to his challenge. Spaniard Ignacio Papp had a steady round, shooting a one under par 71 to finish level par on 144, which would see him take third spot. The stage was set for the two young English boys to shoot it out and with five holes to play James Watts cut Whitnell’s lead to just a shot. But Whitnell proved up to the challenge and birdied the short 14th to regain a two shot cushion. Whitnell and Watts then went toe-to-toe matching each others shots, it could have gone ether way if putts had dropped, but both covered the closing stretch in level par giving Dale Whitnell a deserved tour victory. The tour now moves to Marbella for next weeks tournament.